Yesterday my little Lu went on her first preschool field trip. Oh my, isn't my baby growing up? When she brought home her cute little pumpkin from the pumpkin patch, I decided that we'd use it to decorate the fireplace. But, this one itty bitty pumpkin looked so lonely. 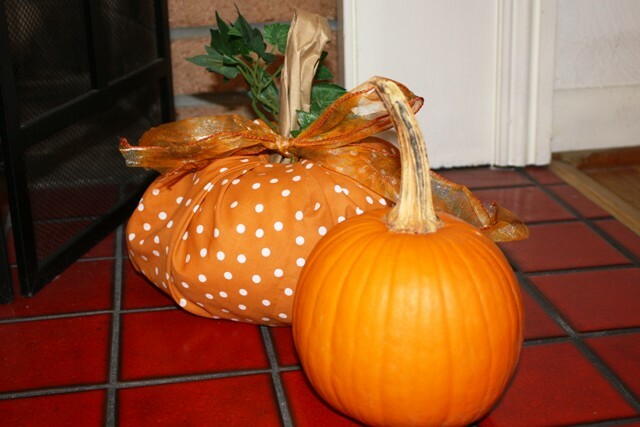 So, I decided to make a friend for it - a no-sew fabric pumpkin! This is a seriously easy (and cheap) craft to make. Not only is it practically free to make, but you can disassemble it after the fall and reuse most of the components. Guess what it's made out of? Obviously, it's fabric, ribbon and a bit of brown paper bag. But what is inside? Yes, that's right. A roll of toilet paper and some plastic grocery bags! Lay your fabric square out flat, and place the toilet paper roll in the middle. Bunch the plastic grocery bags around the roll. Pull up one edge of the fabric and tuck it inside the cardboard roll of the toilet paper. 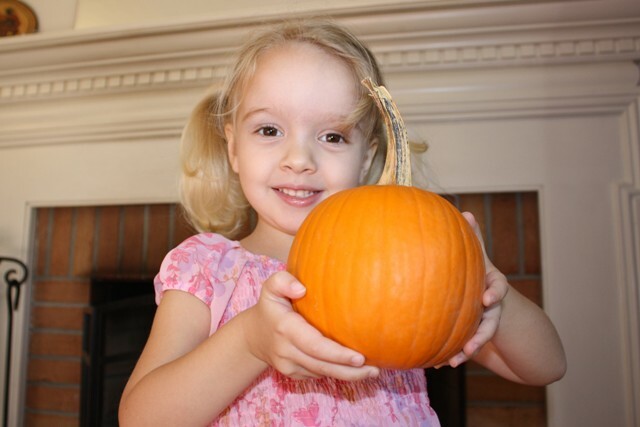 Do this all the way around until you have your pumpkin shape. Stuff your brown paper bag stem (or real stick) and greenery into the cardboard tube along with the fabric. Tie a pretty ribbon around the stem to finish it off. I'm thinking that you could also make larger pumpkins by using a roll of paper towels and a large square of fabric, but I haven't tested it out. If you do, let me know how it turns out. Thanks to my old MOPS group for this fun craft! I miss you all! If you're looking for other frugal ideas, check out Frugal Friday at LifeasMOM. I have my pumpkin out to!